Watch cinema classics for free! Watch full old time movies on your Chromecast device with this app for free. All the classic films on this app are in English language, most of them are American / Hollywood movies. You don’t need to have any Adobe Flash player installed in your device. Movies will be played inside the app using your device’s standard multimedia player. 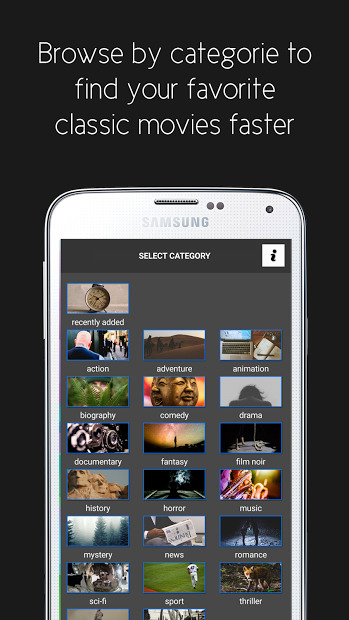 Titles are arranged by category, so that you can find your favorite movie easily. The categories are: action, adventure, animation, biography, comedy, drama, documentary, fantasy, film-noir, history, horror, musical, mystery, news, romance, sci-fi, sport, thriller, war and western. Use your TV as a photo frame!